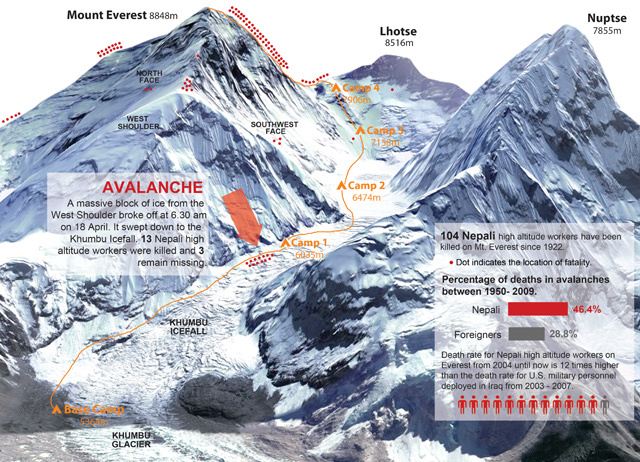 After the avalanches on Everest last year (see infographic) in the spring, and the subsequent cancellations of expeditions, the refusal of operators to refund their clients may keep mountaineers away from the world’s highest mountain. It is important to remember that not all Everest clients are wealthy. Many have patiently saved for a long time and have sacrificed a lot for the chance to summit the world’s highest mountain. But it’s not just about money, it is also about commitment. Doug Hansen who worked two jobs to support his dream to climb, a dream that ultimately cost him his marriage, is an example of someone who embodied both the patience and dedication needed to climb Everest. Tragically, the Seattle mailman was one of several who died in the 1996 Everest expedition chronicled in Jon Krakauer's book, Into Thin Air (see article alongside). When I was in Lukla, coming out of the Khumbu in April 2014, I met a Norwegian who had sold his house to pay for his Everest expedition. More recently, a new category of clients, mainly from countries like Malaysia, Singapore and India, have been seen on the mountain, some of whom are not qualified enough to climb Everest. They often lack a sense of mountaineering culture, and are not yet representative of the average Everest climber. But no matter our level of expertise, all expedition clients have one thing in common: we are tired of being used as cash-machines by greedy operators, locals and foreigners, who use the terrible tragedies of 2014 and 2015 to substantially increase their profits. They do this simply by calling off expeditions and refusing to reimburse a single rupee to their clients who are the ones who make the whole commercial climbing industry possible. Without clients there are no operators and without operators there are no jobs for the workers. In 2014, the average price of an Everest expedition was between $40-45,000 per person, and in 2015 it increased to between $45- 55,000 per person. Yet, when cancellations occur operators claim that all the money has been spent already and, as a result, refunds are not possible. Hence, this means that commercial outfitters make next to no profit. It's hard to believe. There are some clients, however, who have, due to cancellations in 2014, managed to get a discount on the 2015 expedition for which the price had already been raised by operators as early as May 2014. Some companies made it easier for clients to come back in 2015 by charging affordable rates while others, especially at the start of the 2015 autumn season, have substantially raised expedition prices and have blamed this dramatic increase in price on the difficult logistical situation in Nepal. As clients, we cannot claim anything from anyone. Operators will tell you to go look somewhere else for your refunds. Neither the Nepal government nor the operators’ association is any help, and you certainly cannot go to the courts. As climbers, we are spread all over the world speaking different languages and belonging to different cultures, but in Nepal’s mountains we are all treated as walking ATMs. Damien François is a climber and author of The Holy Mountains of Nepal. The government is finding it hard to win donor hearts and minds.